Turbines at the Pisgah Mountain wind project in Clifton are seen in this April 2017 photo. AUGUSTA, Maine — Gov. Paul LePage on Wednesday placed a moratorium on permits for most new wind turbines in Maine, a move that could reverberate regionally a day before Massachusetts is set to announce winners in a massive clean power procurement plan. It’s an aggressive move from the Republican who called wind a “boutique energy source” in 2012. But wind energy has boomed during his administration, going from 4 percent of Maine’s power generation in January 2011 to 20 percent in January 2017, according to federal data. An executive order from LePage on Wednesday created the Maine Wind Energy Advisory Commission to study turbines’ impact on the environment, property values and tourism and said “no permits related to wind turbines” will be issued in certain areas until the commission releases its report. The order is unclear on the affected region, saying protected areas include western Maine, coastal areas and bird migration pathways. But Steven McGrath, LePage’s energy adviser, said it intends to exempt eastern Aroostook County, where there are already turbines in Mars Hill. LePage’s order came a day before Massachusetts is due to pick preliminary winners from 46 proposals from bidders aiming to help the commonwealth procure more than 9.4 million megawatt hours of new renewable power by 2022. The awards will kick off negotiations with the selected projects. A redacted letter of support from LePage’s energy office appears in a file for the “Nine Kings” project, from Pattern Energy and EDP Renewables. It would supply up to 1,200 megawatts of new wind capacity — presumably from Aroostook County — to Massachusetts. 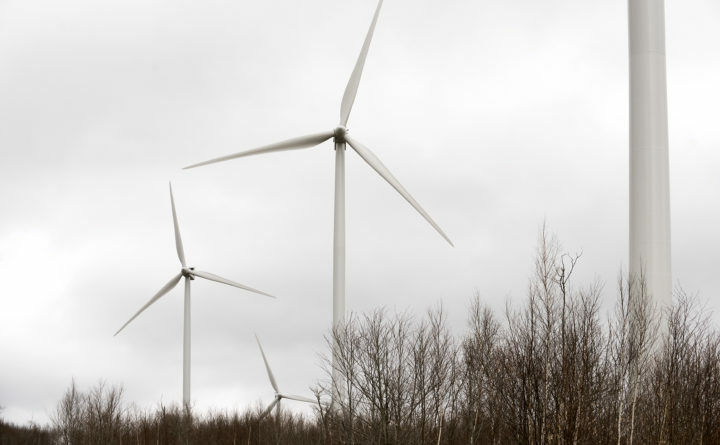 Of the 46 bids, a Bangor Daily News analysis last year found that 14 would be located in or pass through Maine, including 11 that would rely on new wind turbines. Among the competitors is Central Maine Power, which is proposing a hydropower-centric plan and another including wind. But the move won praise from Chris O’Neil, spokesman for the anti-wind energy Friends of Maine’s Mountains, who said it was “welcome and overdue.” He said while the timing “could have been better, it couldn’t have been later” because of the impending Massachusetts awards. “This might appear to folks in Boston as Maine rethinking its previous aggressive stance on wind development,” O’Neil said. Permitting is controlled by the Maine Department of Environmental Protection, but a spokesman for the department said that there are no pending applications for wind projects in Maine. LePage said in a news release that he will submit legislation this year to eliminate an expedited permitting process that is currently in state law for much of Aroostook, Washington, Penobscot and Somerset counties. McGrath said the bill would restrict it to areas in Aroostook County. Dylan Voorhees, clean energy project director for the Natural Resources Council of Maine, an environmental group, questioned whether LePage can unilaterally call for that kind of moratorium, though the governor’s department controls the process. If CMP and the Maine coalition win the Massachusetts contract, Voorhees said there are a handful of companies ready to enter the permitting process for more wind farms. “Wind power in Maine is largely competing against Canadian hydropower,” he said. LePage has long advocated for hydropower to help lower Maine’s energy costs and is staunchly against wind as long as the electricity it generates is more expensive than market rates. The commission will include representatives from the governor’s energy office, the departments of economic development and environmental protection, the Public Utilities Commission, the Legislature, municipal officials, business owners and industry groups. LePage’s executive order also specified that the commission won’t be subject to Maine’s Freedom of Access Act, so its meetings and documents won’t be open to the public. State law allows him to shield advisory boards from the access law by specifying it in an order.